Newspaper men have been in Geronimo Stilton’s family for a long time. Geronimo learns this when he discovers an ancient book, carved into stone, by his ancestor Geronimo Stiltonoot who ran the stone newspaper in Old Mouse City. By publishing the ancient story, The Stone of Fire, Geronimo has enabled the whole world to read about Stiltonoot’s exploits. 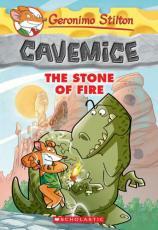 These prehistoric adventures will become a new series, Cavemice, featuring Stiltonoot, along with his family and close friend Hercule Poirat as they solve mysteries in the Stone Age. The Stone of Fire is a precious artefact which has been stolen from the mouseum; Stiltonoot and Poirat suspect the culprits to be Tiger Khan and his ferocious squad of Sabre-Toothed Tigers. The trouble is, Stiltonoot is a self confessed scaredy-mouse and of all the many ways to die in prehistoric times, Tiger Khan is near the top of the list. Luckily, Stiltonoot adjusts his will every morning. Like the books in the Geronimo Stilton and Thea Stilton Series’, The Stone of Fire is fun to read. It is full of humour, wordplay and full colour illustrations including plenty of maps. There is a cavemouse recipe to try out – Meatballs in Primordial Soup – and an explanation of prehistoric table manners with the caution For Cavemice Only. Readers from seven to ten years old, as well as some older reluctant readers will enjoy this story. Look out for Watch Your Tail, the next in the series.